My emotion yesterday? Guilt. From a trash can. And it completely altered my course of action. Throwing anything away is painfully confusing in San Francisco. So much so that many people (tourists especially) will stand paralyzed with their lunch refuse in front of an intimidating wall of bins. The trash, compost, and multiple recycling bins appear so ominous that each will come to life and attack you if you dare put the wrong item into it. The rules, in fact, are so specific, that you have to deconstruct all serving containers to get them into the right spot. 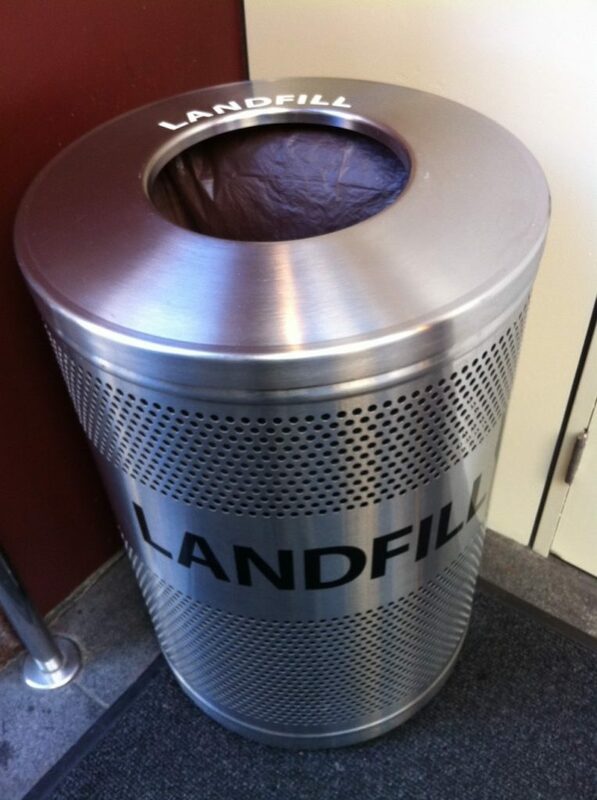 In a hurry, I didn’t see the typical bin lineup as I walked out of the Galleria food court. I did, however, spot a gleaming trash can right on my way out the main doors (yes, I know better and understand that my lack of time management here is not an excuse). I started toward it, ready to sacrilegiously chuck my compostable plate, recyclable soda can, and my legitimate trash straight into it. Ouch. Not just trash, but landfill. Me, contributing to landfill. I saw myself personally delivering my garbage to the horrible, smelly, massive landfill. Overcome with guilt, I promptly turned on my heel and went out of my way to scale two flights of stairs and spend three minutes deconstructing my lunch containers. See. Feel. Change. Make your audience to see something (ex: Landfill Trashcan), feel something (..Guilt), and then they’ll more inclined to change the way they think or act. Think – Is there any kind of visual you can show your audience to garner a reaction? Maybe it’s a thick stack of papers and you’re trying to streamline a form-filling-out process. Do you have a story that you could pair with a compelling photograph? Start looking because visuals are powerful tools. Please share any experience you’ve had with getting people to change! Posted in Messaging, SHARPs and Stories. Tagged Compost, Harvard Business Review, John Kotter, Landfill, Recycle, San Francisco recycling laws, See Feel Change, storytelling. Emotion is what adds the punch. We’ve all been places like the movies, theaters, etc where there was announcement to turn off cell phones prior to the performance. If you’re like me, you sort of either ignore it or assume you’ve already turned your phone off. Most effective announcement I have heard was prior the Opera in Budapest. Rather than making announcements in a variety of languages, they just aired a cell phone ring loudly over their PA system. Immediately everyone in the theater had a moment of panic as we all reached for our phones, assuming it was ours that was ringing. Any emotion, even panic, can get people to act. See – Feel – Change! Other great charities use the same formula because it WORKS, and that’s a Good Thing! Love this, Kelly! So relatable to all in San Fran. Reminds me of my experience in the Colorado Rockies earlier this month when I saw a sign “Drive Safely”, which of course didn’t motivate me to do anything differently. But, within a nano second, I noticed a sign below it that read, “Please. In memory of Lee Herrera.” Wow, now that changed things. Thanks very much for the comment. Amazing what just a single word can do! It’s a great reminder to us all that we can probably pack much more of a punch (even if it’s in the gut!) into our messages. This is a great story. I have stood at that very same station and felt anxiety because it is so confusing and probably guilt for the same reason. I have watched others ponder their choices and they felt exactly the same way. This is a great story to get to the recyclers to tell them that we need clearer instructions. Good visual, too. Anyone who has been to Stonestown or the Galleria can relate. Thanks, Kelly and a great communication lesson, as well. You are a true Decker.